The Moto Z3 is a rugged device with a 6-inch Super AMOLED display with a 1080x2160 resolution. The phone is powered by a 2.45GHz Octa-Core Qualcomm Snapdragon 835 processor with 64GB of onboard storage and 4GB of RAM. There is a microSD card slot for up to 2000GB memory expansion. The device has a dual camera configuration with a 12-megapixel main sensor and a secondary 12-megapixel Autofocus camera with 4K video recording. In front, there is an 8-megapixel camera for selfies and video calls. It includes a non-removable 3000mAh battery, fingerprint scanner, NFC, and 5G moto mod connectivity. The phone runs on Android 8.1 Oreo upon release. 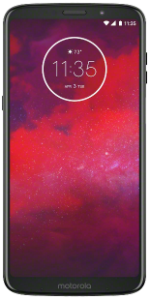 The Motorola Moto Z3 will be one of the first smartphones to support Verizon's nascent 5G network in the U.S. when a 5G Moto Mod with Qualcomm's Snapdragon X50 modem becomes available sometime next year.